Built under licence in Argentina from original plans, this beautiful Avro 504 replica is owned by Eric Verdon Roe, great-grandson of Alliott Verdon Roe who founded the A V Roe Co Ltd (later shortened to Avro) which originally designed and built this aircraft. Reassembled and prepared for flight by our own Matthew Boddington it now has its UK Permit. This aircraft was the subject of an article in Aeroplane monthly in December 2016 and has been flown in displays by Mark Johnson. Typical of early reconaissance aircraft it is extremely slow and stable with a limited rate of turn...great for photography but not survival. 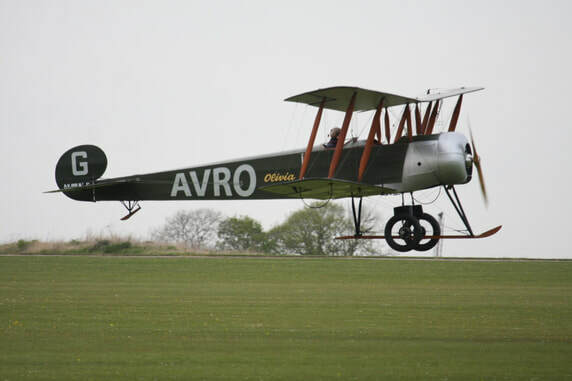 It was produced in great numbers with 8970 serving in the Great War and the type went on to serve as a trainer for the RAF and other foreign air forces including Russia. It had a series of "firsts", as the first RFC aircraft to be shot down by the Germans in August 1914, the first aircraft to strafe trenches and also the first to drop bombs on Germany. 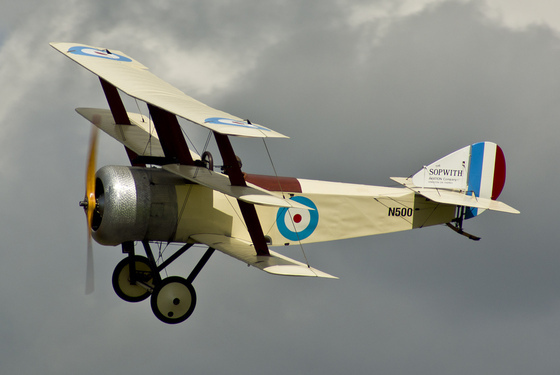 Our Sopwith Triplane is a replica of N500, the first Triplane prototype. First flying in early June 1916, it by-passed normal test-flying and went straight to France to be test-flown in service with A Flight, No1 Squadron of the Royal Naval Air Service, where it is reputed to have been sent up in pursuit of an enemy aircraft within 15 minutes of arriving. By early 1917 two RNAS squadrons, Nos 8 and 10, had been equipped with Triplanes. They were very popular with pilots, being able to out-climb and out-turn any contemporary enemy scout aircraft and having great success against the German Albatross flying in opposition. Only 150 Triplanes were built and they were only used by the RNAS, with the exception of a few which were given to the French who managed to crash most of them on take off or landing, and one to the Russians. Their service life was short and by late summer 1917 they started to be replaced by Sopwith Camels, such was the rapid rate of technical innovation. Although it was later painted in both green and brown dope, N500 first went to France in clear-doped linen, and it is this stage of its life that our replica represents. Built by Ernie Hoblyn, it first flew in 1997. It is currently owned by Gordon Brander who has displayed it since 2010. Designed by Reinhold Platz, the Dr1 was a direct attempt to copy the successful Sopwith Triplane. Armed with two forward firing Spandau machine guns, it was highly manoeuvrable, and was a favourite mount of a number of German aces such as Werner Voss and the legendary Manfred von Richthofen who claimed "it climbed like a monkey and was as manoeuvrable as the devil!" It entered service in 1917 and Von Richthofen's Jasta was the first to be equipped with an eventual total of 320 being built. 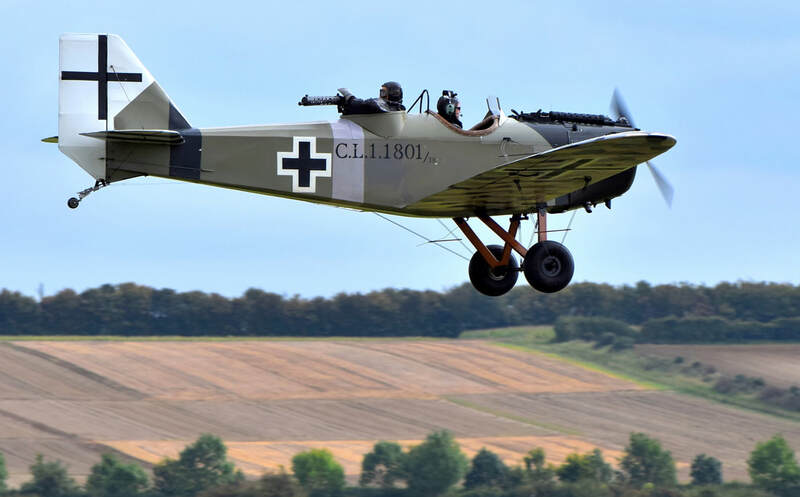 We have two Fokker Dr1s, 403/17 which was built by John Day and first flew in 2006, replicates the Dr1 flown by Lieutnant Johann Janzen [13 victories] of Jasta 6, of JG1. It carries the unit markings of a black/white striped tail and black cowling, with Janzen's personal marking of a 'white snake' line on a black band, edged with white on the rear fuselage. Janzen became 'Staffelfuhrer' [Leader] of Jasta 6 and survived a crash-landing, when the control cables of his Triplane were shot away in combat. The aeroplane is now owned by Bruce Dickinson of Iron Maiden fame and continues to fly with the Team in the hands of Alex Truman. The other aircraft is 556/17 was built by its owner, Peter Bond in 2010. It replicates the Dr1 flown by Leutnant Ludwig "Lutz" Beckmann also of Jasta 6 in March 1918 which was then based at Lechelle. Beckmann survived the Great War having shot down 8 allied aircraft. He went on to win the Knights Cross of the Iron Cross in WW2 and commanded a transport unit of the Luftwaffe flying aircraft such as the JU52 in Russia. The 2 Fokkers have similar colour schemes with the main difference being the colour of the snake band on the mid fuselage. Pete's aeroplane has the red band with white snake. The BE2c was designed and built in 1912 at the Royal Aircraft Factory at Farnborough and was Britain's first-ever military aeroplane. Designed with artillery observation in mind, it was the most stable aeroplane ever built. makers of the film ‘Biggles Sweeps the Skies”. Designed by film model specialist David Boddington, it was built and flown in just sixteen weeks by vintage aircraft specialist Charles Boddington at Sywell, Northamptonshire. Flown, crashed and stored for 25 years in the USA, it was restored to fly again by co-owners Matthew Boddington, son of the original builder, and Steve Slater, back at its birthplace in the UK. The original BE prototype made its first flight at Farnborough on 1st January 1912. It was certified by the Army Aircraft Factory on 14th March, becoming the first aeroplane in the World to be issued with an airworthiness certificate. 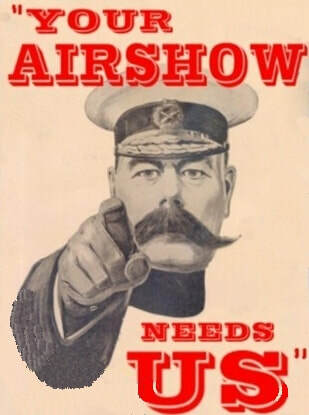 The BE2C was the most popular version of the BE2 which flew from the start to the finish of the Great War with some 3500 aircraft being built and which made it one of the most numerous aeroplanes of the war. It started as an artillery spotter and evolved into other roles such as anti Zeppelin, light bomber or marine reconaissance but was extremely vulnerable to German attack.....they simply referred to it as "Fokker Fodder"
The RAF SE5, originally with a 150HP direct-drive Hispano-Suiza engine, first flew in November 1916. Only 77 of these were built before the engine was replaced by a geared 200HP version. The type went into squadron service in March 1917 and, with another engine change to the 200HP Wolseley Viper, they continued in service right up to the end of the war, with a total of 2765 being built by armistice day. The SE5 was an extremely robust fighter and the first British aircraft to have 2 guns with a Vickers machine gun in the fuselage and a Lewis gun on the top wing. 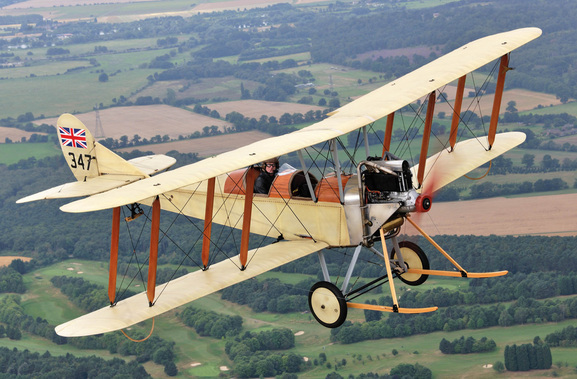 It had a superior performance at higher altitude than the Sopwith Camel and was also faster. We have 3 SE5's flying in the Team and they are owned by Dave Linney, Arnd Schweisthal and Mike Waldron. Dave Linney's aircraft was built in 1978 and was the first SE built from the Replica plans in Europe. First flight was in Dec 1978 and the story was featured in Aeroplane Monthly at that time. It was completely refurbished in 2000. His SE5a represents Zulu of 85 Squadron, which was led by both Billy Bishop and Mick Mannock in 1918. Arnd's SE5a represents Blue 19 of the American 25th Aero Squadron, the only USAS squadron using S.E.5a during the war. Based at Toul, only 2 patrols were flown by this squadron before the armistice. The aircraft was built in America, later sold to Holland and has been operated in the UK since 2005 and been part of the Team since 2007 when flown by Vic Lockwood. It is now flown by Mike or Emily Collett. Mike Waldron built his aircraft in 1995 and it represents B595 of 56 Squadron, flown in June 1917 by Lieutenant M E Mealing who gained an MC for his tally of 12 enemy aircraft. It is currently displayed by Trevor Bailey. The Junkers CL1 was a ground-attack aircraft, based on the Junkers J8 but with an extended fuselage to carry a gunner. First flying in late 1917 it was accepted by Idflieg, which oversaw all German military aviation, but only 47 were built by the time of the Armistice. It was the first ever cantilever monoplane and had a metal frame with corrugated aluminium skin. It entered service on the Russian front in mid 1918 as a ground attack aircraft with 3 machine guns and an ability to drop sticks of grenades.There aren't many two-seaters in the Team and one of the occupants in this one is a dummy. See if you can work out which one it is! This aircraft is actually a modified Bowers Fly-Baby, remodelled to look like a typical CL1. It was originally built in 1988 by John Day, first flying with the Team in its modified form in 2003. It is now owned by Andrew Berry and flown by Mike Collett or Will Greenwood.